If danger is near, just give a yelp, the paw patrol is here to help! it's time to save the day: ride into the action on the 16" boy's paw patrol Sidewalk bike! this multi-character bike takes the fun of paw patrol, combines it with the excitement of learning to ride a bike and wraps it all together with plenty of crucial safety features. It starts with the durable steel paw patrol frame which fits riders ages 4 to 7 and features sweet graphics of marshal, chase and rubble throughout. Riding is easy and simple thanks to the single-speed drivetrain and rear coaster brake (also known as a pedal brake) for intuitive stopping. And removable training wheels make learning to ride easy and fun! you don't have to worry about the next growth spurt - a tool-free adjustable seat post makes it easy to adjust the seat height whenever you need to. Little paw patrol fans will delight in the sweet handlebar plate, laser-printed seat, chain Guard and wheel covers featuring chase, marshal and rubble! 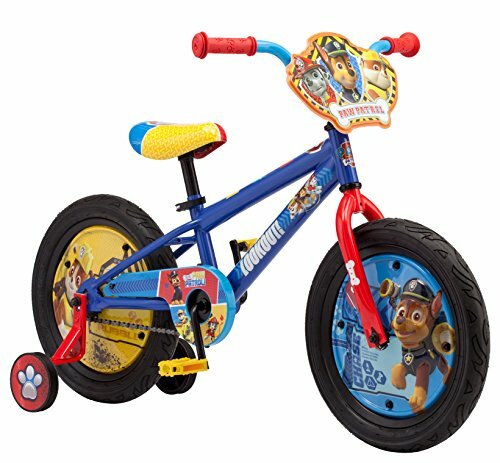 let your little one save the day and learn to ride along the way with the 16" paw patrol bike.